One of the most versatile and durable drum handlers available. Easily-controlled handler inverts, moves and stacks 1828" steel, plastic and fiber drums and cylinders. 360° rotation on a horizontal or vertical plane. 38"L fork pockets. 125° forward dumping. 180° inverting. 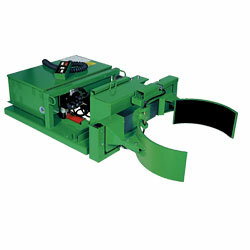 Built-in 12V battery-operated Power-Pak and self-contained hydraulics. (Batteries included.) FOB MINNESOTA. WA-0092 881	 Standard	 2000	 20-1/2"	 20-1/2"	 6-1/2" x 2-1/2"
WA-0093 948	 Drum Hugger	 2000	 20-1/2"	 20-1/2"	 6-1/2" x 2-1/2"
WA-0094 913	 Giant	 2000	 20-1/2"	 20-1/2"	 6-1/2" x 2-1/2"